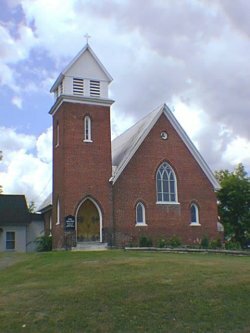 St. Paul's Anglican Church is in the town of Mansonville in the Eastern Townships of Quebec. Nestled amongst the scenic mountains, this small community has held services in this present building from 1902. In 1924 they formed a parish unit with two other Anglican churches nearby, Holy Trinity in South Bolton and St. Patrick's in Bolton Centre. Sunday services at St. Paul's are held every Sunday at 11am. On the 5th Sunday of the month, a joint service is held together with all three points in attendance. The church is located at 309 rue Principale, Mansonville. You are most welcome to join us for Sunday worship.